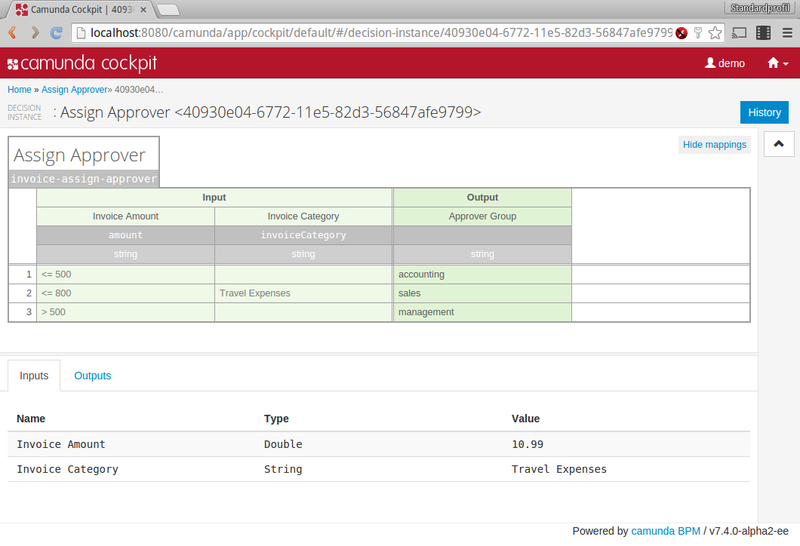 Today we release Camunda BPM 7.4.0-Alpha2. This is the second alpha release previewing the upcoming 7.4.0 Release. Overall more than 170 issues were closed. See complete Release Notes in Jira. Cockpit now provides a preview of the support for DMN-based Decision Auditing. 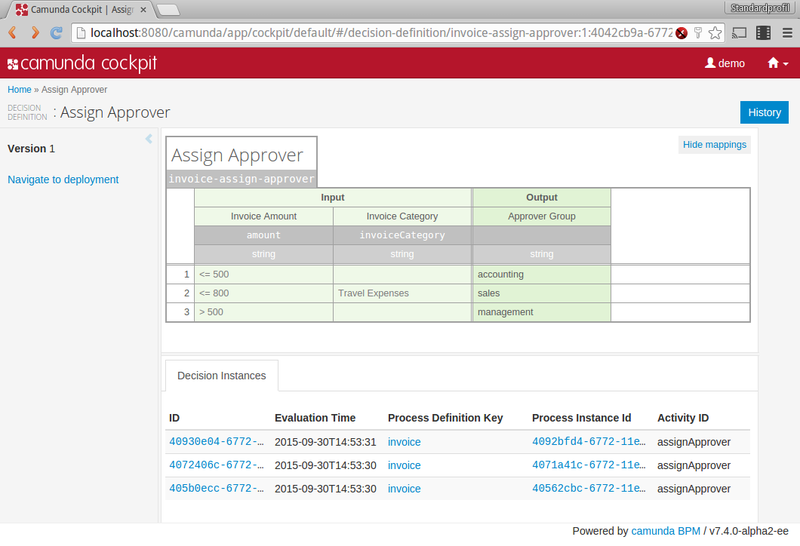 This view displays the decision table itself and displays aggregated information of all past executions of the decision table (decision instances). displaying aggregated information about how often each rule in the table fired, and so on. 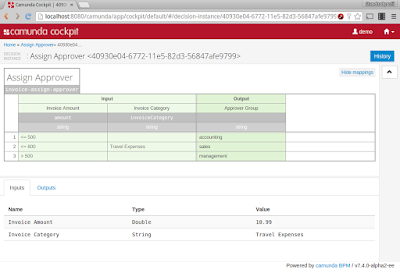 The Decision Instance view provides information about an individual execution of the decision (table). The focus of this view is to allow users to inspect an individual decision, understanding which rules evaluated to true (and why?) and what output was produced. At the moment it is possible to inspect the input and output values of the table. This view can will be enhanced by visualizing as much information as possible inside the table itself, including highlighting of fired rules etc. 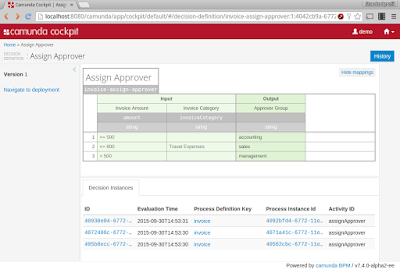 Since quite a while, our man Jakob has been preaching about how BPMN allows intuitive visualization of statistics and data around process execution. "Even something like a heatmap, you know like the weather man uses, is easily possible", he used to say. 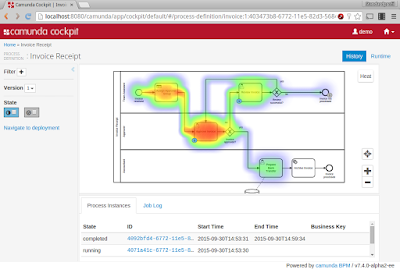 At some point Matthias Wiedemann -at the time working for our consulting partner Opitz Consulting- actually built a BPMN Heatmap as a Community maintained Cockpit Plugin. The plugin was a huge success and everybody wanted to use it. But, since it was a community maintained plugin, people did not always have time to port it to the latest version of Camunda or ensure compatibility with all versions. It also had a lot of limitations around how the visualization was rendered (because it was a proof concept implemenation) and we thus decided to re-iterate on the idea, rewrite the code and add it to cockpit as an out of the box feature. The Camunda Engine now fully supports BPMN Escalation. Again, the performance and efficiency of the job executor has been improved. Read all about it in Thorben's Blogpost. We have completely revamped the whole documentation, improving content, structure and the layout.